What is delegate control in SharePoint? Why to use it? Delegate control in SharePoint allows developers to manage control on a master page without touching or editing master page. Actually, delegate control is associated with a feature. 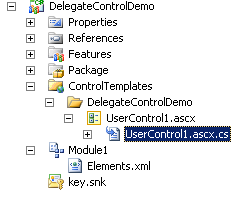 Whenever that feature is active delegate control will be visible and if an associated feature is de-active delegate control will not be visible to users. To do this, create a SharePoint project in Visual Studio 2010. Add a user control and a module in your project. Now your project hierarchy should look like this. Now open Element.xml file under Module1. So your new Elements.xml file should look like this. Now build and deploy your project. Make sure your feature is activated. Your output is shown in below screen. Now again go to feature and de-activate this, come to your page and see the difference. Hope you are now clear about delegate control.